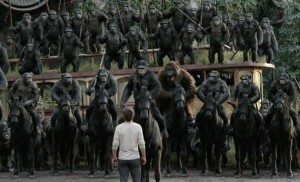 In preparation for this reveiw, I unearthed my review of the last ape movie, Rise of the Planet of the Apes. I gave it 2 ½ bells. In comparison to this sequel one might compare the first to Citizen Kane. Rise has plot, action, quirks, a variety of scenic twists. Dawn has none of that as the entire plot become obvious in the first few minutes, after which boredom sets in. I may have lost a few brain cells while watching it. It was directed by Matt Reeves (who replaced director Rupert Wyatt of Rise), the only thing good about it is its special effects. When we last left the apes, there was a hint that the serum that made the escaped apes smart would make humans sick. Sure enough, in this sequel most humans have been wiped out by the ALZ-113 virus except for a few who serendipitously were immune to it. 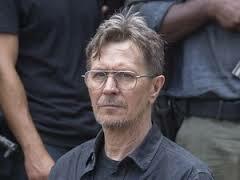 They are huddled in San Francisco trying to make do under the leadership of Dreyfus (Gary Oldman). It’s been 10 years, and they are beginning to lose power, with a two week window before they lose it altogether. So much for planning ahead. Somehow the only place they can get more power is via a power station at a waterfall in Muir forest to the north, where the apes live. Note: It isn’t clear whether the humans have had electric power and lost it, never had power or are about to lose it. The above is my interpretation but online summaries differ and the film is confusing. Spoiler here: When they get power someone frantically tries to radio out to see if there are other human survivors extant, which might lead one to think that the group never had power. But this film is not well suited to people who actually think. 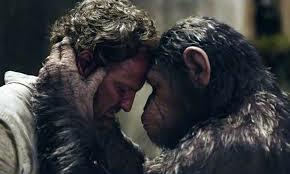 The apes are led by the wise Caesar (Andy Serkis), who, along with his deputy Koba (Toby Kebbell), can speak a bit as well as using American Sign Language (ASL), which all of the apes can use and understand. 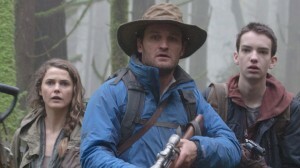 In skirmishes with the humans, led into the woods by Malcolm (Jason Clarke), Caesar is more trusting while Koba is clearly more warlike and power-hungry. And even though the humans gain permission to work on the power plant, various forms of sabotage and distrust on each side build to cause increasing antagonism and fighting. That’s about it, really. There are a couple of cutely invented aspects to the movie. The “women” apes have all donned decorative head bands! The apes have adopted human cultural attitudes about “families.” Wow. Other anomalies include the countless weapons in good working order and of course tons of available ammunition. But my favorite detail is the fact that in spite of the incredible destruction that has occurred, it would appear that electrical wires and charging cables have also survived in convenient spots, as we see two key electrical devices in use immediately after power is restored. Wow. In between great visual effects of hundreds of apes moving from place to place, we get what are supposed to be conversations. Most human talk goes on between Malcolm and his son Alexander (Kodi Smit-McPhee) and new wife Ellie (Keri Russell). They refuse to be separated from him so they accompany him to the woods (unlike the apes who shield their women and children….) . The characters are flat and the dialogue excruciatingly slow and mundane. Conversations among the apes are likewise limited, but they sort of have an excuse. Nevertheless, I would invite literally no one in the movie over for interesting dinner table repartee.